So, you've become one of the masses. That doesn't mean you have to wander into the background. You can struggle to the top the same way you did while you were alive! But how do you prove that your mindless wandering is better than all the other mindless wanderers? By making your face more disgusting than all the other zombies, of course! Here's the thing— there are zombies out there that think they can float by with just a little blue eyeshadow under their eyes and some blood coming from their nostrils, but you’ll show them. Embrace your dead side and flaunt your gory self! 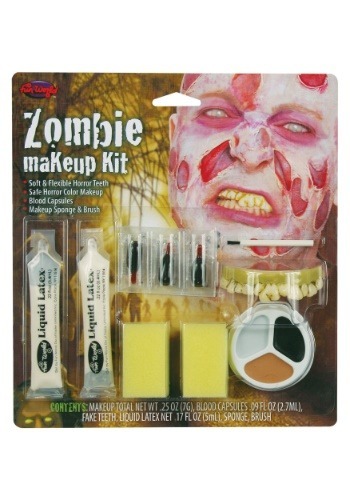 This makeup kit will help you become the zombie you were meant to be. Whether you've been taken down by a virus, parasite, or evil spell, this makeup has everything you need to transform. You'll get a ghostly white, black, and brown in creme makeup cake form that can be applied with the included sponge and brush applicators. And most importantly you'll get the liquid latex, perfect for scarring and horrible skin peeling. Top the whole thing off with the blood capsules and gnarly teeth and you'll be good to go. Use this kit and play your cards right and you'll be the head of the flesh-eating pack in no time! 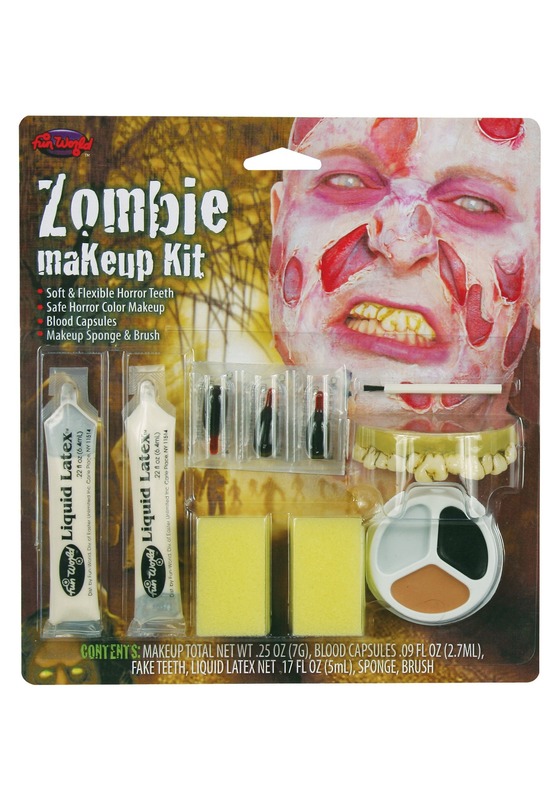 Whether you're dressing up for a horror house, a zombie bar crawl, or a simple Halloween party, you'll enjoy getting creative and disgusting with all that this kit has to offer. We just hope we don't run into you when you're hungry.